Special savings accounts for holidays and vacations allow you to enjoy yourself during these special events without worrying about how you'll pay for them. 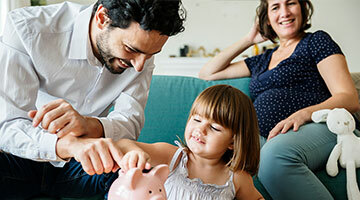 Special events like the family vacations, Christmas and other holidays make for great memories, but they can also put a strain on the average household budget. Opening dedicated savings accounts for holidays and vacations eliminates the stress of trying to stretch the monthly budget. By making incremental deposits into these special dividend-earning accounts throughout the year, you ensure that your household budget stays intact and that you have enough cash when special events roll around. For your Christmas Savings Account, save enough for the all your holiday activities or just for the gifts you normally purchase. For your Vacation Club, save to cover the entire trip or just the airfare portion. However you decide to plan it, you’ll love how much easier it is to manage the expense by saving ahead of time. Set up Direct Deposit and allocate a portion of each deposit to go to your Christmas and Vacation Savings Accounts. You can also schedule automatic transfers from your checking account to your Christmas and Vacation Savings Accounts via Online Banking. Choose your checking or savings account for the annual disbursement—Vacation Savings Accounts pay out in early May and Christmas Savings Accounts pay out in early November. If you withdraw or transfer funds out of your club account prior to the annual pay out, you will incur a fee as disclosed in our fee schedule. No fee will be charged if the withdrawal occurs within 7 days of opening the account.